Back in April we moved into a new apartment and our in-laws were our very first guests. I always fret over what to serve them since they aren't the most adventurous eaters. After some serious thinking, I settled on a Middle Eastern luncheon. 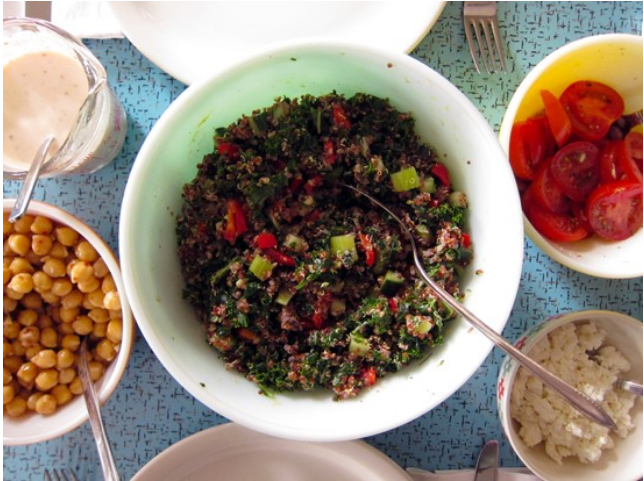 There was an array of different small dishes: bbq chicken skewers, a garlicky chickpea salad, fresh tomatoes in vinaigrette, a bowl of crumbled feta, and this quinoa and kale tabbouleh. Even though the kale and quinoa might be a little left of centre for them, I figured this meal would be bright and flavourful with lots of different options for snacking. 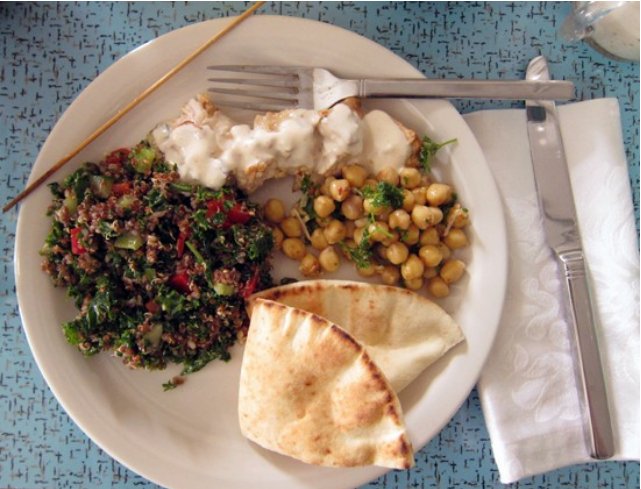 Tabbouleh is something I associate with my mom. She made it quite often and I remember she made it the very first time she had the in-laws over for dinner. My version is a bit different from the traditional. 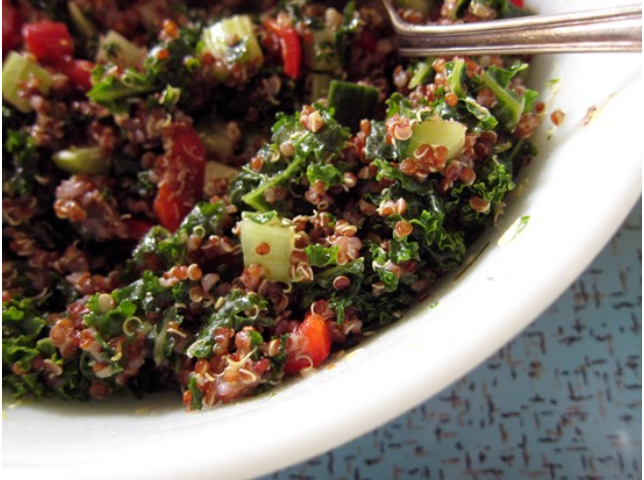 Quinoa replaces the bulgur and the kale substitutes for the mass of parsley usually found in tabbouleh salads. I still keep the parsley around, plus some mint, but I think the kale was a great addition. The key here is to massage the kale with some salt to remove the liquid and bulk from the leaves. It's easier to eat and it kinda resembled the parsley as well. I'll have to massage my kale more often! It turned out to be a great lunch! While everything on the table was tasty, I filed this salad away to be made again. It was lemony and herbaceous and filling. I loved how fresh and simple it was to put together. And it made for great leftovers the next day too. In a medium saucepan, toast the quinoa over medium heat, shaking until mostly dry and then add in 2 cups of water. Cover and bring to a boil and let simmer over low heat until water is absorbed. Fluff with a fork and set aside uncovered to cool. In a large bowl, cut the kale into bite sized ribbons and add in the salt. Massage salt into the leaves until the kale becomes wet and dark green. Squeeze out the liquid and then add the kale to a large serving bowl. Add in the cucumber, onions, tomatoes, red pepper, parsley, and mint. Toss with the cool quinoa. In a small jar, add the lemon juice, olive oil, red wine vinegar, garlic, salt and pepper and honey and shake well. Taste and adjust seasonings. Pour over salad and toss well before serving. Makes 4-6 servings. I've got some picky Eastern European in-laws too. 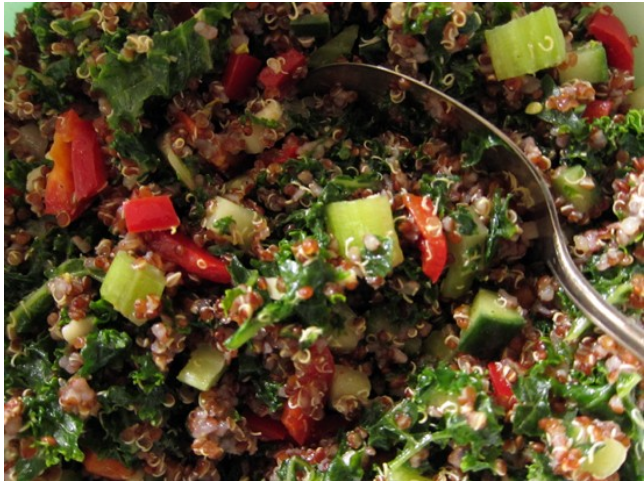 This quinoa and kale version of tabbouleh sounds delicious!! I've been hearing about kale massage from various sources but I have yet to try. Will have to give this a go soon.